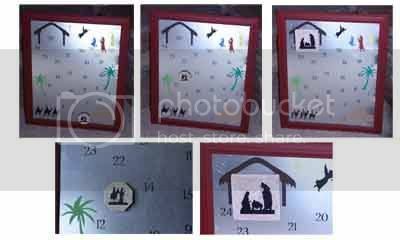 The Journey to Bethlehem advent calendar is a great way to celebrate the reason for the season all month long! Each day, move smaller tile (Mary on the donkey and Joseph) one step closer to the stable. They end at the Stable on Christmas Eve. On Christmas morning, replace the small tile with the larger tile that depicts the manger scene. This is a lot of fun for children and adults alike! Makes a great Christmas gift! Sized for a 16X20 space. The numbers come pre-spaced and the colored items come separately so you can place them where you would like them. Other sizes available upon request. (Pictured in a 16X20 picture frame). Price includes vinyl only.